Uncas, supported by his sons Owaneco and Attawanhood, permitted the colonists to establish themselves within a piece of land nine miles square. The place was known as Mohegan until 1659 when Norwich was incorporated. Uncas insisted to the colonists that sixteen acres abutting the ravine next to Yantic Falls be left in perpetuity to the Mohegans as a burial ground. 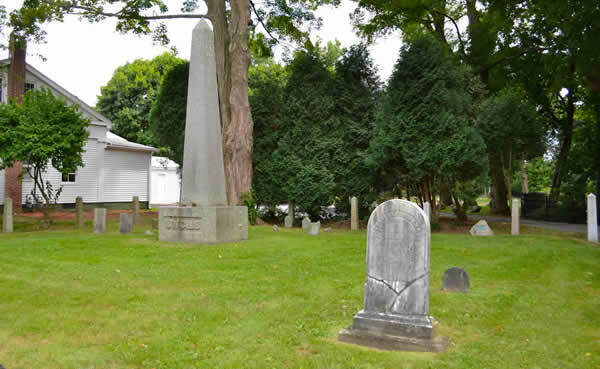 The colonists promised to keep the burial grounds untouched. English colonists and Native peoples often had different understandings about what constituted ownership, use, access, and responsibility for lands, waters, and the living creatures present within them. The written deeds that sometimes accompanied land negotiations did not always fully reflect such distinct views. This, combined with the need for translating across multiple languages, lead to misunderstandings. Uncas strategically made way for an English settlement within Native space. As neighbors of the Mohegans, these English settlers remained in close proximity to the tribe with access to the harbor and deep tidal river.